Will Kasich's new Ohio Medicaid makeover please conservatives? The John Kasich administration wants to transition to a more conservative Medicaid expansion that would allow Ohio to drop adult beneficiaries who don't pay into a health savings account, regardless of their income. In his 2015 budget proposal, Kasich, who is running for the Republican presidential nomination, suggested assessing premiums for adults above 100% of poverty. GOP state lawmakers last summer passed a bill to have it apply to all program beneficiaries. Pundits aren't sure that will help Kasich win votes among those in his party who did not approve of the Ohio governor's decision to expand Medicaid in 2013. On Monday, his administration posted a summary of a waiver the state plans to submit to the CMS for approval. Under the plan modeled after Healthy Indiana Plan 2.0, Medicaid beneficiaries above and below the poverty level must contribute monthly to a health savings account. The amount must be equal to 2% of income but not exceed $99 per year, or $8.25 per month. Members who are more than 60 days behind on payments would be dropped from the program and required to pay back the amount prior to re-enrollment. The waiver is not likely to be approved since, to date, HHS has yet to OK a waiver that allows individuals below the federal poverty level to lose coverage for not paying into an HSA. The full waiver will be posted for public comment on April 15 with the docket closing May 13. A public hearing on the waiver will take place April 21 in Columbus. The state is seeking a Jan. 1, 2018 implementation for what it's calling the Healthy Ohio Program. The state will need to re-bid managed Medicaid contracts and plans to kick off the new procurement process July 1, with selection expected by March 1, 2017. 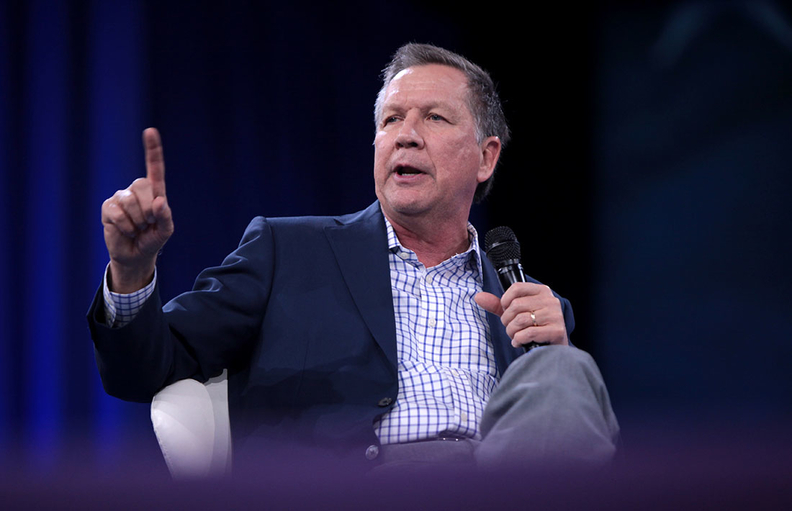 On the campaign trail, Kasich has faced considerable criticism for his 2013 decision to bypass the state Legislature to expand Medicaid under the Affordable Care Act while saying he would support a repeal of the health reform law. His move led to 600,000 state residents gaining coverage. Republican insiders aren't sure this new conservative approach will curry favor with staunch ACA opponents. “The governor's proposal is good policy and good politics,” said David Robinson, a former Republican member of the Ohio House of Representatives and founder of the Montrose Group, a lobbying firm. Tom Zawistowski, an Ohio tea party leader, said that on face value, Kasich's move should garner approval among conservatives, but he said there's shattered trust. Kasich has only won one primary: Ohio's. Advocates in the state are concerned about Kasich's proposal, according to John Corlett, a former Ohio Medicaid director and executive director of the Center for Community Solutions, a not-for-profit, nonpartisan think tank. “If this gets approved, a large number of people will lose coverage,” Corlett said, adding that other states that imposed premiums on low income people tend to see enrollees drop coverage. Arkansas and New Hampshire are expected to submit waiver requests in the coming weeks, with the latter state asking that enrollees be actively looking for work as a condition for coverage. HHS has repeatedly said it would not approve any waiver that demands that as a condition. The state of Kentucky might also be considering a waiver model with more conservative principles. The state's new Republican governor, Matt Bevin, has expressed interest in doing away from the traditional Medicaid expansion done by his Democratic predecessor.